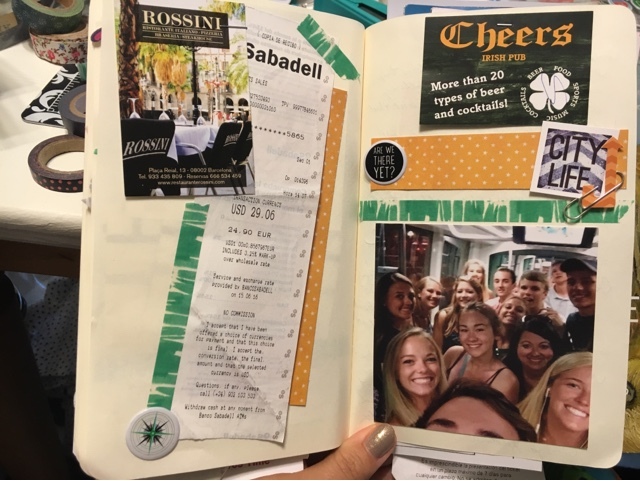 Today's post is a tad late, but I wanted to share with you some of the progress I'm making in my TNs that document my trip to Europe from this summer. 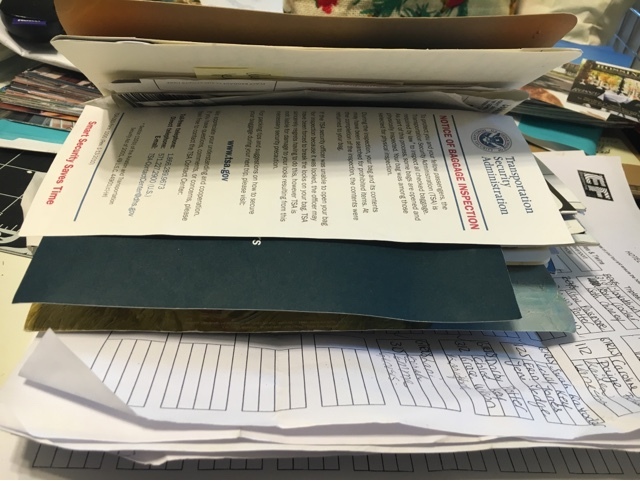 First, I gathered all the ephemera and bundled it by date in the first TN. As you can see, there was a ton of ephemera. 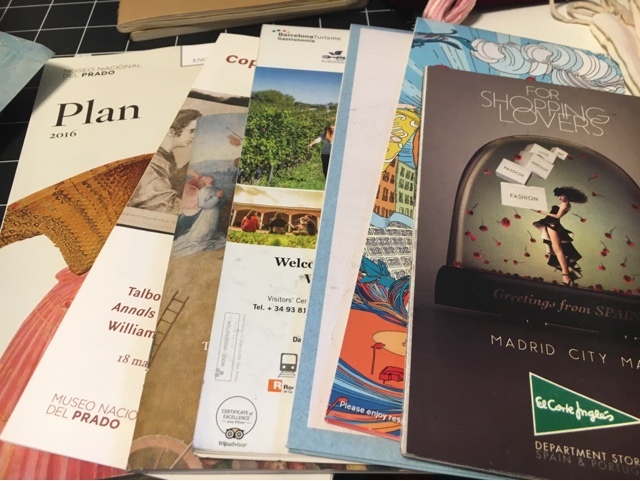 For the thicker pieces like maps, I gathered those and intend to put them in the flap located in the back of the TN; I'm using the cahier size/style from Barnes and Noble, and they come with a flap at the back inside cover already. 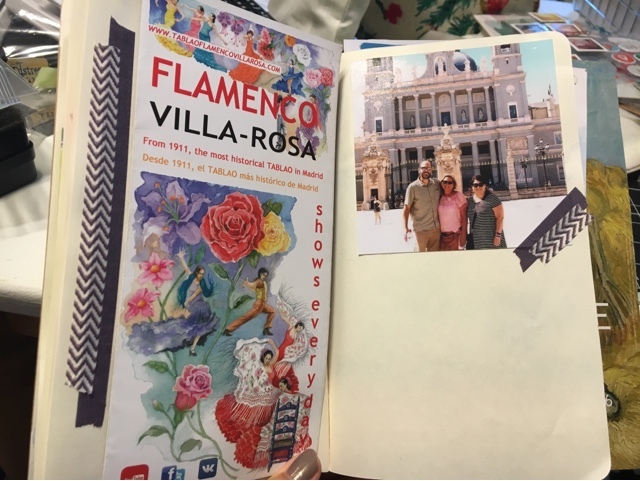 Here's the title page I made for my TN; I used some travel themed paper and a die cut I've been saving for just such an occasion. I really like the cork numbers I used; wish I had a bunch more of those. 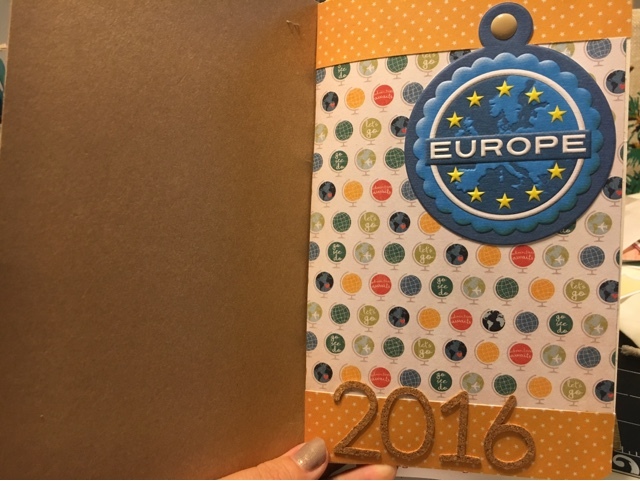 The first couple of pages had lots of journaling, so I only embellished the bottom of the second page a bit. The tape at the top of the second page is there because I accidentally ripped it a bit dealing with the ephemera on the other side; no worries since washi tape is transparent though. 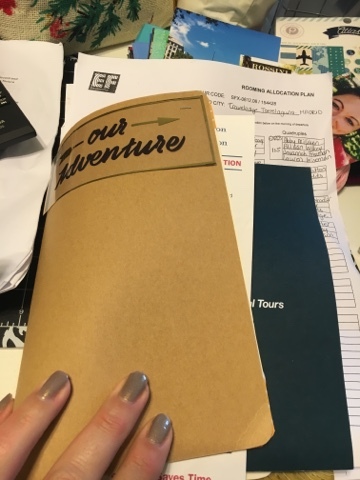 You are still able to read my journaling through my little mishap. 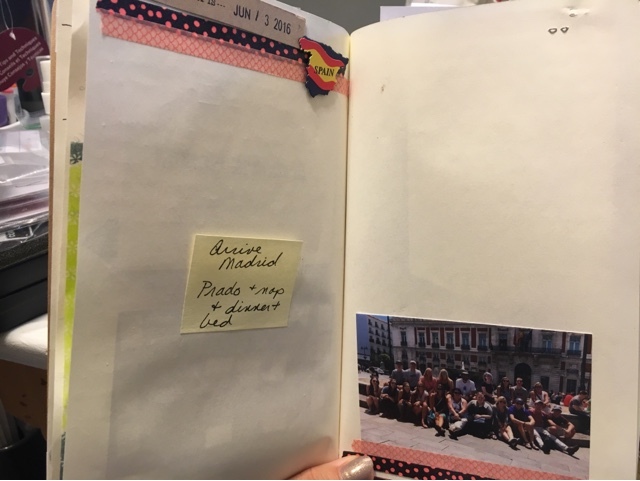 Here are the next two pages that correlate with the first day of travel. I stapled in my airline tickets and baggage labels because I thought it was fun that I kept those. 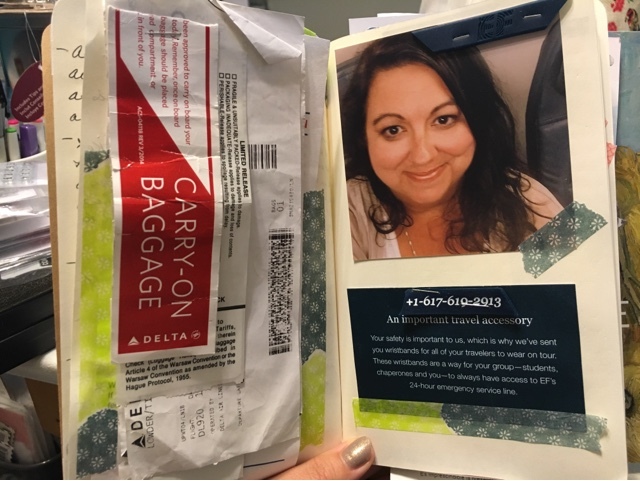 On the facing page, I have an airplane selfie and a piece of cut-up ephemera from the company I use for student travel. To carry on the washi theme and make it look purposeful, I added some to both the left and right sides of the spread. I've only started the layout for the next day. 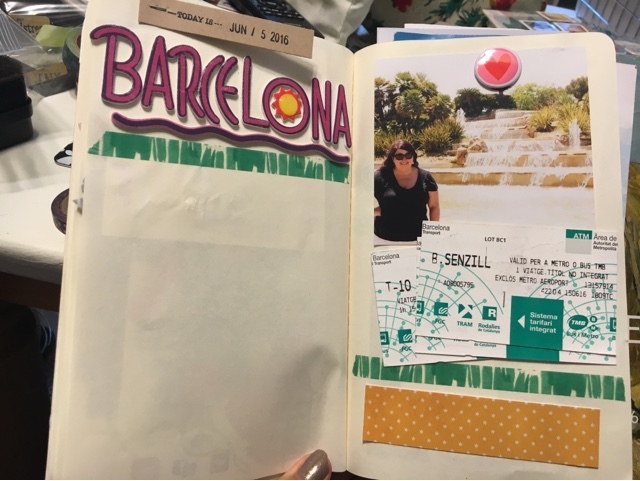 You can see some washi tape, a couple of embellishments, and a photo that I plan to use. These pages will be mostly journaling. I have gone ahead and attached the ephemera for the next spread even though I need to have a photo printed to add to the left hand side. Here, you can see a couple of receipts, a map of a museum, a ticket, and a bit of washi tape to interest. Again, I've just started the next spread. Yes, I have a photo and an embellishment and a receipt adhered already, but I still need to journal about this day. 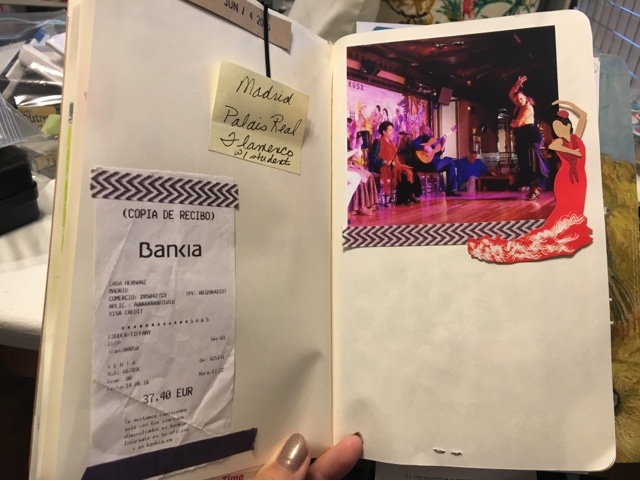 On this spread, I adhered the brochure for the flamenco show we saw and a photo of the three trip chaperones. Notice that I'm using washi tape on each page for interest and continuity. Plus, I just think it's cute and makes the TN feel more homespun and casual. Here's another spread that I've started but not finished. Like the others, this one needs some journaling included. I've already added a fabulous title I'd been hoarding, a pic I like, some metro tickets, and some embellishments. Now, I just need to write down some of the story. 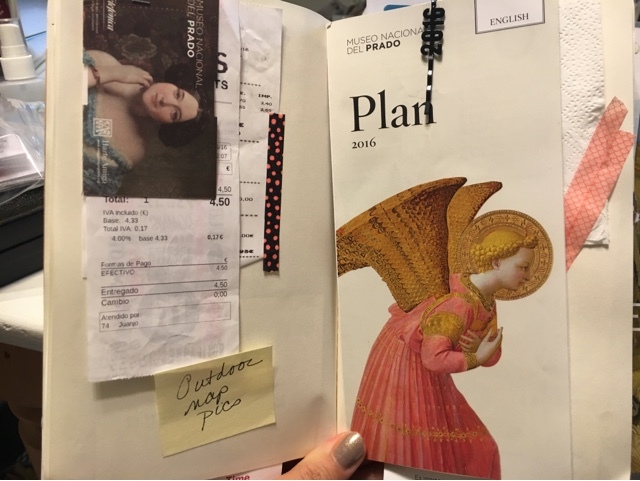 More receipts and business cards and embellishments + another fun photo make up this page. I think I'm pretty much finished with this one since I'll tell the story on the couple of pages just before this spread. This looks wonderful! 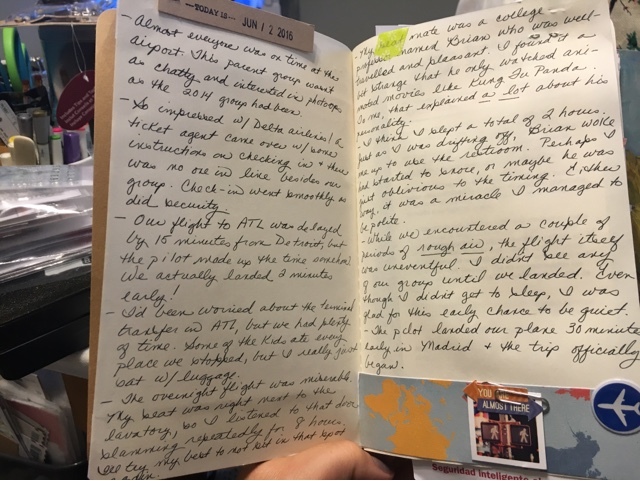 I have really fallen for travelers notebooks this summer - there's a nice casual-ness about them that has me feeling relaxed when I'm working in one. This is going to be a great keepsake of your trip! Thanks for sharing. It looks great! TN are my new faves and I love seeing how other people are using theirs. Looks great!! I love the ephemera heavy journalistic style. A readable version of a fabulous culture immersion. So awesome.